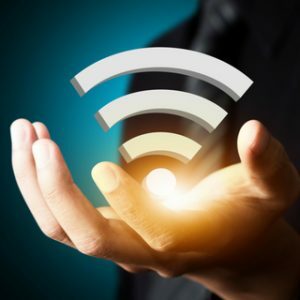 As technology moves ahead, more devices come equipped with the ability to connect to a WiFi network (WLAN). In turn the reliability of a WiFi network becomes increasingly important. MTI’s WiFi as a Service (WaaS) is a fully managed service that allows your business to maximise the potential of using a WiFi network, without having to deal with the hassles of keeping the infrastructure up-to-date, dealing with faulty equipment and applying security policies that protect your network. This managed service is achieved via each individual access point reporting back to MTI’s cloud based administration console. Monitoring, reporting, alerting and updates are all performed via our team, in most cases remotely without you even having to think about it! Should hardware fail, we support the system, right through to replacement of hardware. Reliability: In the traditional setup, if an access point in the office fails, thorough investigations would need to be carried out (usually onsite) to determine the cause of the WiFi not working in that particular area. This downtime impacts the users ability to perform their duties. Via this service, the fault is immediately identified, and we can quickly work towards rectifying the issue. Security: Did you know that routers and access points can be released to the public with software issues and vulnerabilities that can allow people from outside your organization to log into your network? Using our service, we will keep the access points up to date; this means that any known issues are fixed up before they can possibly allow major security breach. Performance: As manufactures tweak the software platforms for their hardware, performance enhancements are written and released. Again, keeping on top of these items means that your WiFi network is performing at the optimal speed. Using our service, we will keep the software updated. Monitoring: Our service lets us know when things are not going well. This could be in the form of failed hardware, knowing the issue we can quickly respond and address the root cause. Reporting: Reporting can show us what areas are being over or underutilised. Traffic consumption, performance figures and more. Guest WiFi: Allows someone to connect to your WiFi as a guest, giving them internet access, without allowing them access to your internal network. Often used for contractors. Customized Policies: Allows multiple users and devices to connect securely to the network according to your access policies. Upgrade Policy: As new technology becomes available and when your end points can utilise this technology, we will then roll out the new hardware as part of this managed service.